An outbuilding on Centenary Road caught fire Sunday evening, resulting in a total loss. GALLIA COUNTY — Saturday evening around 6 p.m., reports of a fully involved structure fire at the intersection of Mount Zion and Musoc roads in Walnut Township came into Gallia County 911. According to Greenfield Fire Department Chief Bradley Davies, both Greenfield and Harrison Township fire departments were dispatched for the call due to its proximity to the coverage boundary between the departments. Rio Grande Fire Department was also dispatched for mutual aid, as the initial units on scene reported a house that was completely consumed in fire. 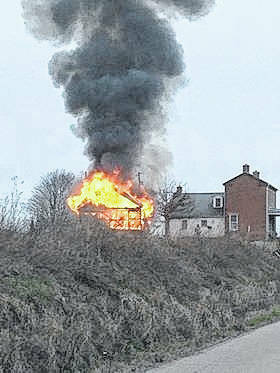 According to Davies, the fire resulted in no injuries or casualties to humans, although several dogs may have perished. “We have no idea about the cause. I haven’t been on very many structure fires that are that involved when we get there, it was rolling,” said Harrison Fire Chief Austin Phillips. Davies said the home was a total loss. Then, at approximately 5 p.m. Sunday evening, the Gallipolis Fire Department was dispatched to a fully involved structure fire of an out building in the area of Centenary Road in the area of McKean’s Farm. According to Assistant Chief Mike Null, the building was around 24 square feet and a single story, with a large amount of black smoke coming from the structure. Null also stated that some puppies did die in the fire, although he did not know how many or what breed they may have been. Rio Grande Fire Department also responded with a tanker to assist with water. Null said there was an exceptional amount of heat for such a small building. “There was exposure problems, we were worried about it spreading to the house but the guys got it contained in time to prevent any damage,” said Null. Firefighters on scene did call for the Ohio State Fire Marshal’s office to investigate the cause of the fire.